The last weeks were bad weeks for all of us who believe in peace and coexistence. Hell, it’s been a bad year so far. There was the terrorist attack in Tunisia and new reports of young people from Europe being groomed to join IS. A new IS member highlighted in the Swedish news supposedly comes from the projects in Malmö in Sweden, where I once worked as a substitute teacher. Maybe he is one of my former students? Even though my teaching job was several years ago, I remember my students well and still run in to them downtown sometimes. Unfortunately very few of them have been able to break the cycle of poverty and alienation. I know some of the boys I used to teach are now in jail, and the girls, now young women, I often see pushing strollers outside the discount store, married early and on welfare. And now we are starting to loose some of our young ones to the terror machine of IS. If the new Swedish recruit is one of my former students, this would be almost unbearable to know. But then last week something happened in my own life, something surprising, that turned things around. Since it’s been a bad year for most of us believers this year, I decided to share the story with you. On the evening train a young woman sat herself opposite of me. A classy girl, one of those I always envy: nice jacket, glossy hair, carrying a trendy, cream-colored bag full of books and papers. She kept peeking at me from her side of the small table. Suddenly she spoke to me, asked something about a school. “What?” I unplugged my headphones. When she said her name, I couldn’t believe it. Was this really she, the young and angry girl that had once been one of my students? I remembered her well: a girl that had possessed the mix of sharp intelligence and inability to make use of her talent. She had confidence, I remember how she in an essay called “My Dream Job” wrote that she wanted to be the Prime Minister of Sweden, whilst other girls wrote that they wanted to marry a football player. But most of her energy she put into fighting with other students and bullying teachers, instead of her schoolwork. We leaned over the small table between us and hugged. I asked where she was going on the train. Within seconds, words spilled out. She was studying a bachelor’s engineering program in another city. It was long hours and hard work but she really liked it. After junior high school where I had taught her, she had wanted to get away from the projects and applied to a new high school in the other end of the city. She had coerced her mom to sign the school application. The daughter of uneducated refugees from Kurdistan, she had started a school where everyone else had well-off parents. She had to study more than full time in order to keep up with the other students. Her grammar, vocabulary, everything had been at a much lower level than her peers’. It had been three years of tears and hard studying, and from her family she couldn’t receive any help, but she didn’t cave in. When graduating high school she had the grades to enter university. She stilled lived with her family in the projects, they hadn’t been able to move out, but she wasn’t in touch with anyone of her old classmates. When I asked about the kids that had been in her class – I was curious to know about them – she didn’t know. When the train stopped and we went off, she hugged me and wished me good luck for the future. Soon she had disappeared in the early darkness of the March evening, I watched her bouncy ponytail as she disappeared. She, the girl with so little chances who had made it so far, had wished me good luck for the future. It used to be the other way around. Of course I didn’t tell her, but that evening, she was my light in the global darkness. No matter how far IS will advance, or where European terrorists will strike next time, my former student will still be my light, a hope to hang on to. One million dollars couldn’t beat that feeling. In Malmö University in the city of Malmö, Sweden, a university that prides itself of being very mixed and with students from many different countries and backgrounds, a Muslim student discovered someone having posted a print of one of the Muhammed caricatures on the public notice board. These news was shared with me by Swedish journalist Nizar Keblawi, who made a news coverage about the incident in Swedish public TV, and then e-mailed me the news. The student who saw it, Lina Abu Zarour, snapped a photo, removed the print and gave it to the Students Union, who handed it over to the university’s administration. It turned out more pictures of the same kind were posted at the university, about four or five. The university reportedly took the matter seriously and launched an investigation. In media, university staff said they encourage all students to report such offences and pointed out that students from all backgrounds are welcome at the university. Her take on the postings of the caricatures is that people are usually scared to know of new things. By sharing baklava with hadith quotes, she wanted to teach the other students more about her religion in a friendly way. And many students showed up, some of them wanting to show their support to the Muslim students at the university. Lina Abu Zarour made headlines in Swedish media with her response, and was among many things invited to an in-dept interview in Swedish radio. What more is, she was able to show the whole country a way to respond to hate and ignorance: with kindness. Saudi Arabia is not known for respecting human rights, and the current campaign for releasing the liberal Saudi blogger Raif Bedawi has shed light on the old phenomena of human rights abuses in the Gulf. But, like everywhere, there are exceptions to the rule. The media group Tefaz 11 has produced a rap video shedding light on the situationen for foreign workers in the country, using the traditional tactics of humour and music to get their message through. The group is produced for Saudis, consisting of Saudis, showing that there is a diversity within Saudi Arabia and that everyone in the country does not support the discrimination that foreign workers are going though – or the human rights situationen as a whole. See the video above, and below is a BBC clip portraying the people behind the video. After IS destroying ancient sculptures in the Mosul Museum, cleverly videotaping everything and uploading the demolition online for the world to share and condemn, without reflecting over the fact that we are all a part of IS propaganda machine, without actually putting the means in to stop them, a different kind of response came from Sweden. “I have to tell this story and why this is an endless sorrow. This photo was taken exactly 43 years ago outside the Mosul Museum that is now destroyed. In the picture you can see my mom, she is in the middle of the back row, number five from the left. In front of her sits her younger sister. What we see in the picture are girls on a Scout camp. 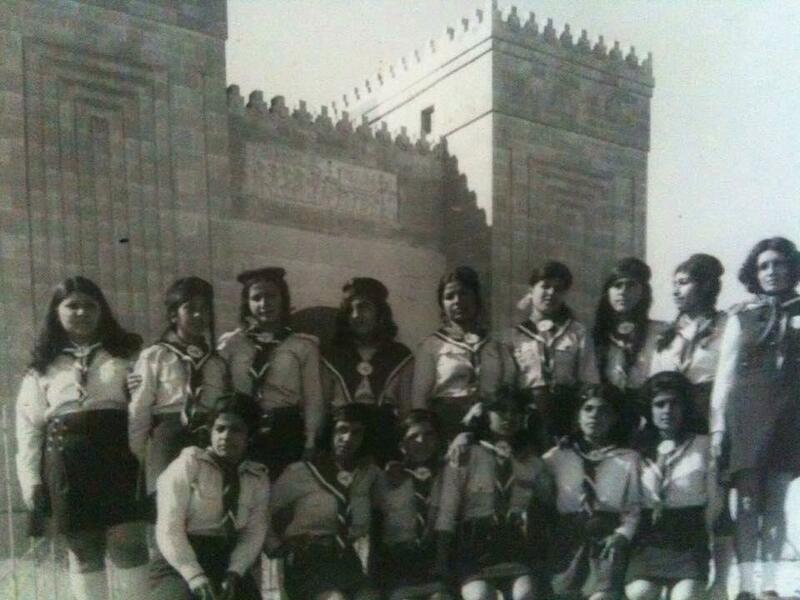 Each summer a number of girls were chosen from schools in Karbala and Najaf, to go on a camp in a new city in Iraq. Several girls come from deeply religious families, some of them had parents who were illiterate. But the trust and the confidence made the families allow their daughters to go on camps in places that were far away from home.